People used to have serious contradictions about the shape of the earth for centuries and most of them claimed that the earth was flat just like a tray. The roundness of the earth has been verified as a result of logical and mathematical explanations over the last centuries. And after the development of technology, it was also visually proved that the earth was round when man went to space and the moon. In fact, the Qur’an referred to this fact miraculously centuries ago. This verb which is used for wrapping a turban around an aspheric thing like the head is also used in order to express wrapping the night up in the day. In the verse, while it is expressed that the night is wrapped up in the day, it is also expressed that the day is wrapped up in the night. The reason for the formation of day and night is the aspheric structure of the earth. The aforementioned action of this verse can only be actualized if and only if the earth has a spherical structure. In this verse, the word which is translated as “spread” is “daha”. The word “Daha” comes from the root of “dahw” which means “to spread”. Although the word “dahw” means to spread or to set out, this is not a prosaic action in terms of its meaning. For, this word is used to describe actions for setting out and adjusting spherically. The meaning of roundness is also present in other words derived from “dahw.” For example, the word “dahw” is also used to describe children dropping a ball into a hole in the ground, games involving throwing stones into holes and games played with walnuts. Words derived from that root are also used for an ostrich to make a nest, to clean stones from the place where it is about to lie down, for the place where it lays its eggs and the egg itself. Indeed, the shape of the earth is rounded in a way that resembles an egg. The flattened spherical shape of the Earth is described as geoid. In this regard, the use of the word “daha” in the verse contains important information about the earth given by Allah. 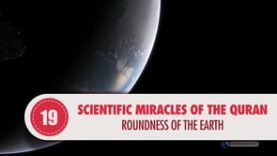 It is understood from these explanations that the Qur’an informs us about the roundness of the earth. However, it does not explicitly describes it but only indicates it so that centuries that could not understand the roundness of the earth would not suspect about the news of the Qur’an and oppose it. Is it possible for a human being who does not know how to read and write to discover the roundness of the earth on his own 1400 years ago? Definitely not. Then, this news cannot be the word of a human being. This news can only be the word of Allah, who created the earth and gave the aspheric shape to it. We believe in it!